I am hopping with Stamp 'N Hop today. Our theme is favorite DSP. I've chosen Delightfully Detailed Laser Cut Specialty Paper. It it like a super detailed die cut, but so fine that it would be very difficult to replicate successfully by using a metal die to make it. I started with Brusho crystals and an aqua painter and water colored a background. I used Prussian Blue, then added some Brilliant Red. Because I added the red crystals on top of the blue wash, it ended up a lovely pinkish-purple. 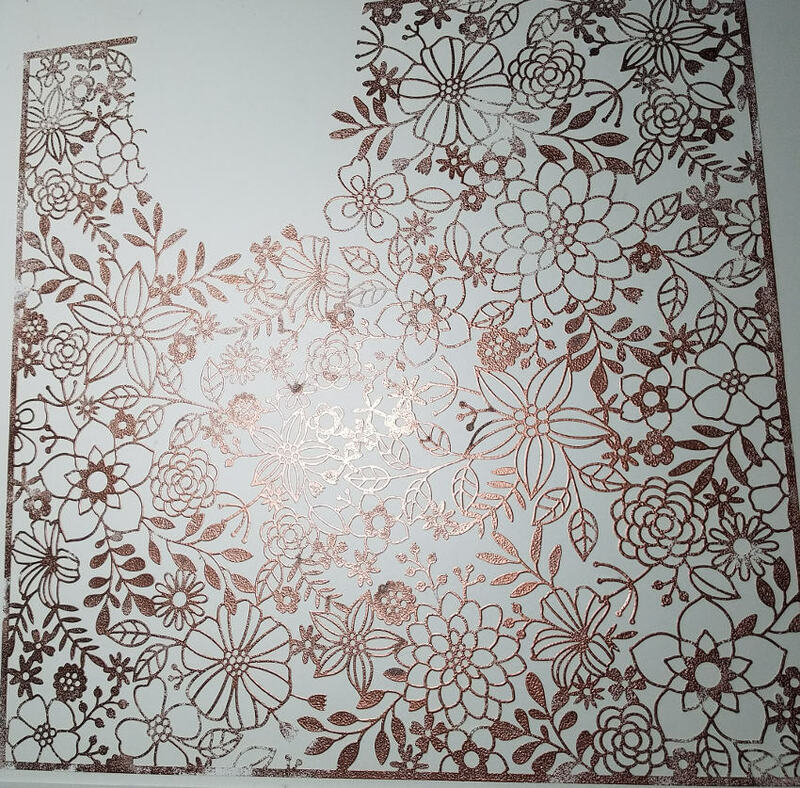 Next, I heat embossed an entire 12" x 12" floral sheet using copper emboss powder. I wasn't overly particular knowing I will emboss a second layer after I've cut out the piece for use on a project. I did want to get a good idea what the copper would look like and this seemed the best plan. Here is the sheet after I cut out what I used for the project. I used mono glue to cover the back of the focal layer. Some mono glue is spread on a teflon sheet, then it is picked up with a sponge to transfer the glue to the back of the DSP using a dabbing motion. It was quick and easy. Mono glue dries clear so is a great option. 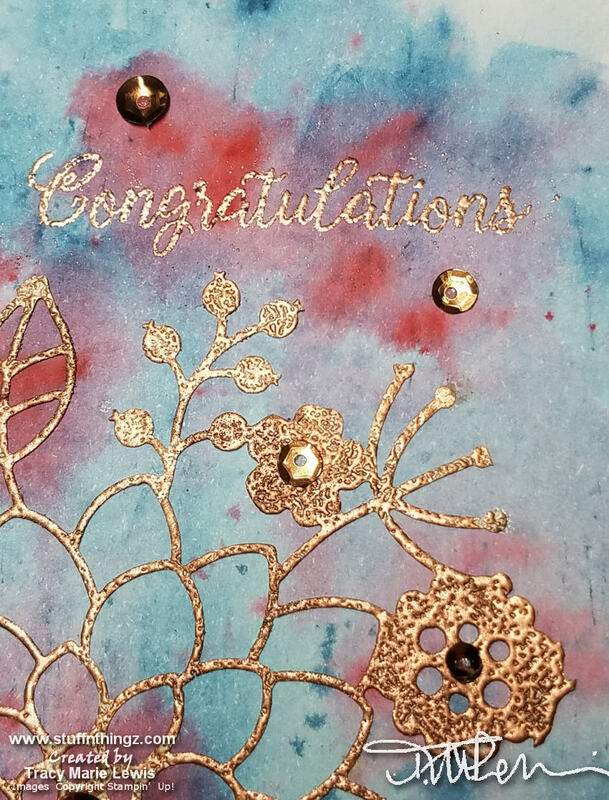 After the focal flowers were dried I chose the sentiment (From the Beautiful Bouquet stamp set) and used copper to heat emboss it directly onto the watercolored background. I trimmed the focal down to 3 3/4" x 5" and made a very thin Lovely Lipstick mat. I adhered it to the base with dimensionals and applied copper sequins to finish it off. I then selected one of the smaller sections of the DSP and as I was cutting it, I made a video showing real time how I carefully cut down the 12" x 12" into the smaller sizes. My emphasis is on the most even borders on all four sides. 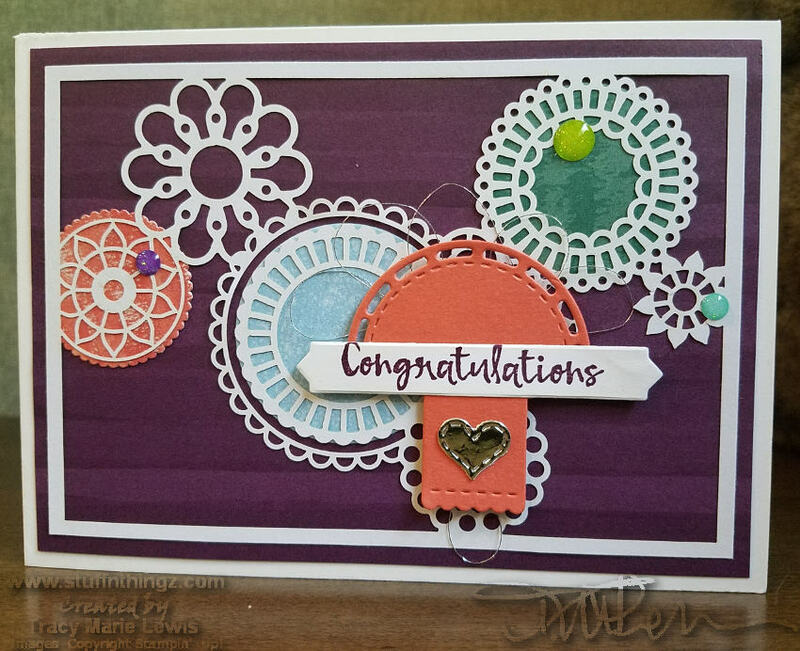 The second project is a circles congratulations card. The three colored circles were cut using Layered Circles die cuts. The Calypso Coral circle on the left is Nature's Poem DSP, the middle Balmy Blue circle and the Tranquil Tide circle on the right is Tranquil Textures DSP. I used Stitched All Around and Lilypad Lake dies to create the Calypso Coral, Silver Foil and White sentiment collage which I popped up and laced Silver Metallic thread around. I finished it off with a few glitter dots. I hope you like these projects and the video. Don’t forget to leave a comment before you hop to Cheryl to see her lovely project. If you get lost along the hop, you can use the Roll Call List below to help guide you along. 5) Susan Simpson (UK) Craftyduckydoodah! As a Stampin' Up! Demonstrator, I am here for you. I would love to be your demonstrator if you do not have one. I have an extensive channel on YouTube with a large mix of videos on papercrafting and the full time RV life style. Fresh YouTube content is uploaded weekly. 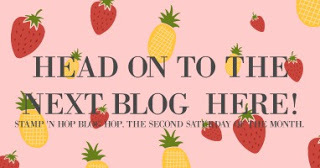 I seek out inspiration and new techniques by participating in challenges, blog hops and various demonstrator communities so I can bring you relevant content on my blog. If you are looking for a low pressure sales experience where you work at your own pace doing what you love, becoming an independent demonstrator is a great option. 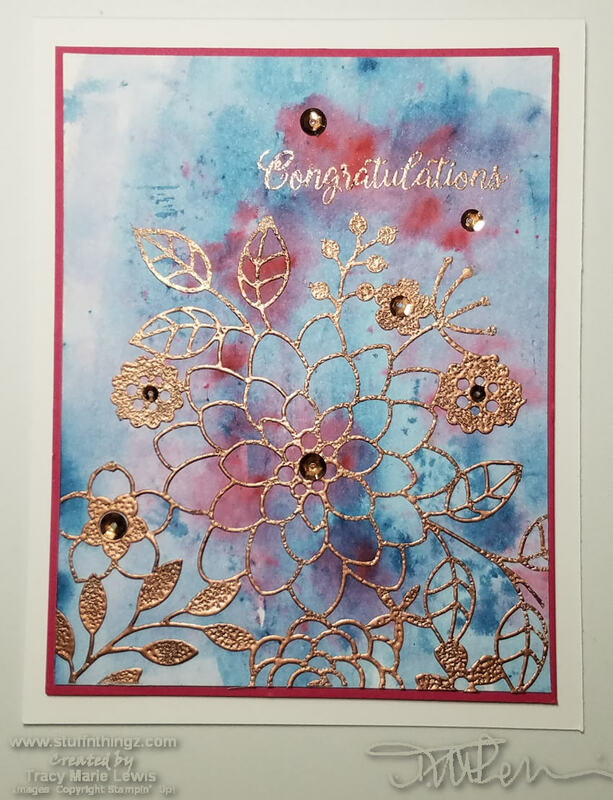 If you are looking to get a discount on Stampin' Up!s great product line, you can become a hobby demonstrator. I am growing a non-location specific team of demonstrators. I utilize on-line tools to communicate and share business knowledge and creative skills as well as to provide a positive working and creating environment for new recruits. Consider joining the fun! I wondered how this paper would hold up to embossing. So nice to see your project! Great job! Love it, never thought of embossing it. I love how you have heat embossed the DSP. Lovely projects. I never would have thought to heat emboss that dsp! What a brilliant idea!